Can the external app create XML documents (in Unicode)? If it cannot send data in XML, what format can it send the data in (text, binary)? Any other restrictions? Such as: Cannot send dates in XML format (YYYY-MM-DD). 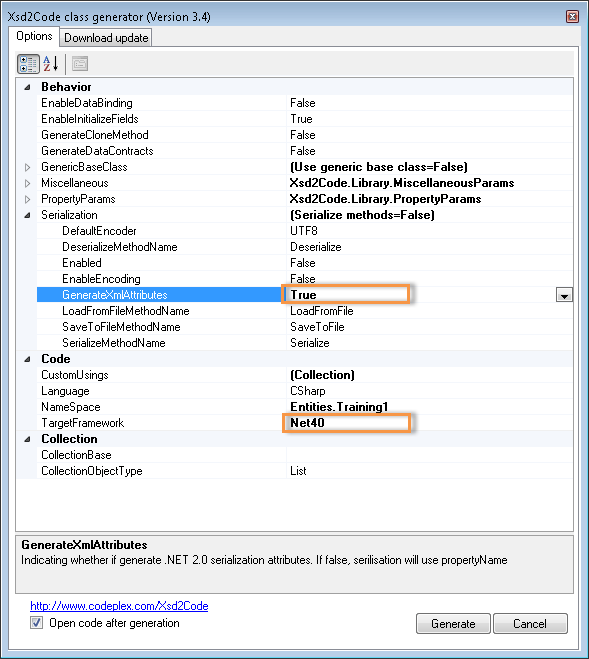 The class library is created in Visual Studio using the LynX Business Process template. This template creates a class library project with references to the Lynx.Net libraries. This depends on the area of integration. For example, if you want to create address book records in EnterpriseOne, you will need the Address Book and/or Customer, Supplier master business functions (N0100041, N0100042, N0100043). You are creating a business process to create address book records in E1. To do that, you need to call the Address Book MBF. The Address Book MBF has upwards of 80 input parameters, depending on your E1 version. Your input source does not have all these 80 input values, but has the most common ones used to create an address book record – the name and address fields. In E1, the name field is restricted to 40 characters and the address line fields are restricted to 30 characters, so your XML schema for the input document should probably reflect this restriction. You can use this to build your sample document: the fragment saves you a lot typing. In my previous post, I described the following coding steps, so I won’t repeat myself here. Retrieve the data from the XML document. Create the output document. This document will be returned to the caller through the web service. You can do SELECT on table and view objects, and INSERT, UPDATE and DELETE database operations on table objects. Keep in mind that E1 row and business unit security are in effect during these operations. Create an instance of the table or view. Set the list of columns to be selected by setting the SelectColumn property of the table column. For views, all columns are selected, so this property does not exist. Create an instance of the table. Set the InsertValue of all table columns. // yes, this can retrieve errors from work center! As you can see, LynX.Net is very powerful – you can create integrations in a familiar development environment without losing any E1 functionality. Please reply to this post if you have any questions. Categories: Uncategorized | Tags: .net, C#, enterpriseone, integration, jde, lynx | Permalink. Wouldn’t it be nice to write programs in C#/.Net to integrate external applications with E1? Harness your existing skill set or the (vast) existing pool of .Net resources? And do this using a familiar IDE – Visual Studio? Now you can, with Aellius LynX Business Integrator, an Oracle Validated product. LynX Business Integrator runs on top of EnterpriseOne’s application layer, so you are in compliance with EnterpriseOne’s security (i.e. no “back door” access). 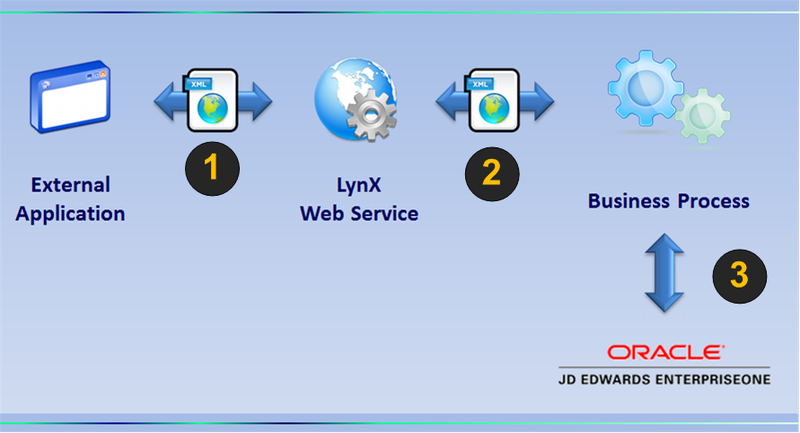 Here is a simplified architecture diagram for LynX Business Integrator. The external app creates an XML document and calls a web service. The web service passes the XML document to an integration server, which executes a LynX Business Process. The Business Process interacts with EntperiseOne internally through native C-API. Provides a standard way to validate the document. So, you don’t have to write custom code, for example, to mandate that an address book number should be a numeric value with no fractions with a maximum length of 8. Keep the same web service method for all integrations. For example, the external app can call the same web service method to upload Address Book records and query Address Book records. The difference between the two calls is in the XML document passed to the web service method. The integration ID uniquely identifies a Business Process. The integration ID must be specified in the input document. This allows the system to identify the target XML Schema to validate the document. Here is a sample document to find Address Book Records. The integration ID for this document is ERP.EOne.FindAddress. Here is a sample document to find Fixed Asset Records. The integration ID for this document is ERP.EOne.FindFixedAsset. Note: There are no restrictions on what you can do in the .Net class. Everything that .Net has to offer is available to you. You can use the XmlDocument object or deserialize the document to a typed object. The DocumentContext provides properties and methods to do this. So, how do we access E1 objects in C#? By generating typed classes that represent the underlying E1 object. dnetgen, a command line utility, creates typed classes for the specified E1 objects and compiles them into a library. That library is referenced in the business process library. The following screenshot shows how to generate a typed class for the F0005 object. The difference? Using the generic class is prone to errors. If you mistype the value F0005 in the constructor, a runtime exception will be thrown. The typed class catches these errors during compile time. Also note the implicit string conversion to get the selected value in the generic class. In the typed version f0005.TcUserDefinedCode.SelectedValue is typed to string data type. Before the ProcessDocument method exits, the document is finalized. This is done using one of the FinalizeDocument overloads of the Document Context method. Finalizing the document indicates that you are done with the request and that it is ready for the caller (of the web service) to receive. In the next post, I will give you examples of C# code that illustrate the E1 capabilities of this product. 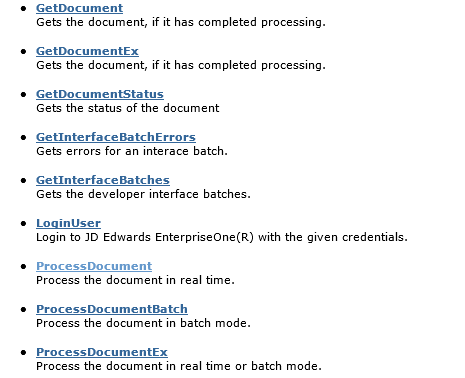 Categories: lbi, Uncategorized | Tags: .net, C#, enterpriseone, integration, jde, lynx | Permalink.